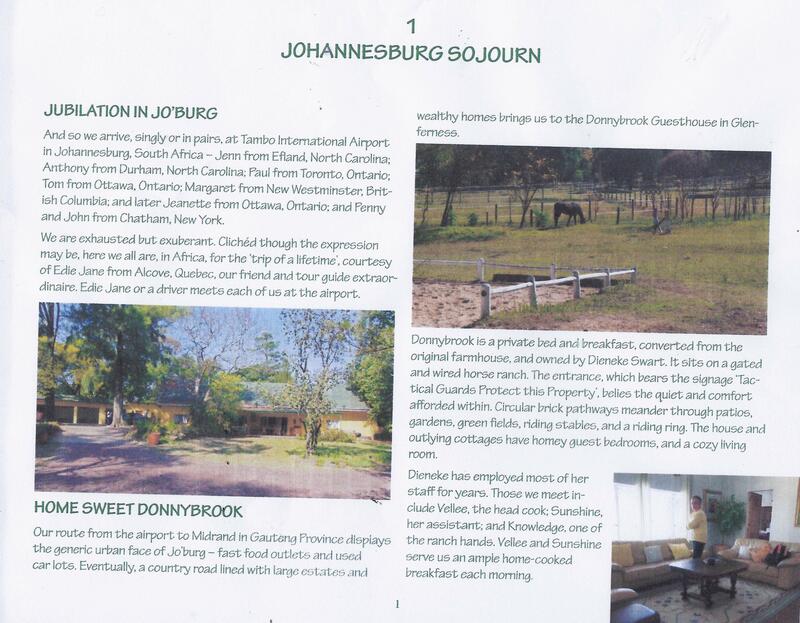 At Donnybrook Guesthouse we aim to keep our guests comfortable and happy in our beautiful country environment. We’re proud of two awards which we have to share with you. Sleeping Out awarded Donnybrook Guesthouse Best Establishment in Glenferness 2015 and Best Value for Money in Glenferness 2015 for their annual Guest Satisfaction Awards. This wonderful review was written and published in a personalised photo book. Thank you Margaret! “Our route from the airport to Midrand in Gauteng Province displays the generic urban face of Jo’burg – fast food outlets and used car lots. Eventually, a country road lined with large estates and wealthy homes brings us to Donnybrook Guesthouse in Glenferness. Donnybrook is a private bed and breakfast, converted from the original farmhouse, and owned by Dieneke Swart. It sits on a gated and wired horse ranch. The entrance, which bears the signage ‘Tactical Guards protect this property’, belies the quiet and comfort attached within. Circular brick pathways meander through the patios, gardens, green fields, riding stables, and a riding ring. The house and outlying cottages have homey guest bedrooms and a cosy living room. Dieneke has employed most of her staff for years. Those we meet include Vellee, the head cook; Sunshine, her assistant; and Knowledge, one of the ranch hands. Vellee and Sunshine serve us an ample home-cooked breakfast each morning. “Greetings from Kilifi, Kenya. We arrived back to Kenya Safely on the 31st August. We had a nice memorable moments at the Donnybrook Guest House. We thank you very much for your hospitality and making a birthday cake for our daughter. My daughter tells me that this is a moment she will never forget in her life as the holiday coincided with her 12th Birthday. My family is all praises for your hospitality and the nice guest house that you have that makes one to feel at home away from home. We are also very grateful to your staff especially “Sunshine” (what is her name?, the one from Zimbabwe) who made us feel at home and made us nice breakfast. We are also very grateful for the nice arrangements you made with Mr Lionel for helping in transportation in and around Jo’burg. Please pass our most sincere regards to him. We hope to visit Donnybrook in the near future. We also hope you could get time and visit us in Mombasa on the Kenyan Coast. LONG LIVE DIENEKE, LONG LIVE DONNYBROOK GUEST HOUSE and ALL. “We always stay at a place called Donnybrook whenever we go to SA – earlier this year my 2-year-old was in hospital in Sandton Clinic and I found myself driving to and from the hospital by myself. Donnybrook was awesome because it is a total of 2 turns – that’s it – very easy to get to – right slap bang in the middle between Midrand and Fourways and literally 10 minutes from Sandton Clinic. Dieneke Swart, the lady who owns the place is fabulous – creates a very homely environment and can offer a variety of different options from single rooms to self-contained cottages.